“What style are you?” was a popular question that was asked instead of “Would you like to dance?” back in late 90’s. Ask any old-school dancer about “The Style Wars” here in the United States and you will probably elicit a groan that will reach Herrang Dance Camp in Sweden. I won’t rehash the details here, but Jerry Almonte has a nice article in his Artistry in Rhythm series, in his blog Wandering and Pondering that touches the issue. Yehoodi like always, has a post about the style wars. Bobby White even lampooned it in a Jam Cellar email, coining the term Savollywood. For the longest time I was looking for a picture of a flier handed out at some workshops in the early 2000s which had a great explanation of what Hollywood Style was all about, but to much avail could not find it. Recently I stumbled upon and I am putting it up so, hopefully it will not be lost again. This flier, among other things were an attempt to get people to spend less time debating about how to dance and more time actually dancing. However as usual the community moved onto arguing about newer topics such as should follows wear or not wear heels? the merits of Wiggly Hop Groove style Lindy Hop. Yeah, if I remember correctly nobody “won.” I think for the most part people realized that not only was the battle stupid, it was really about nothing. Erik & Sylvia originally coined the “Hollywood” term as a buzzwordish way to identify the style that they taught and pay homage to the fact that they borrowed a lot more from Dean Collins and his gang than from Frankie Manning and his. Then a bunch of idiots (read: Lindy Hoppers) decided that “Hollywood” equaled “Dean Collins”, and therefore “Savoy” equaled “Frankie Manning”. Furthermore they inexplicably decided that not only were the styles completely 180-degrees different from each other, each with its own technique and feel, not just in the movement but in the lead and follow. The real kicker was when everybody decided one was inherently better than the other. How it all got to that point is a mystery along the lines of Stonehenge or crop circles. Anyway, a couple of years later it all finally wound down. Justin and Jenn in particular were instrumental in that, by carrying around to their workshops a video they made that showed both Frankie & Dean, side-by-side, in the same position relative to the camera, doing swingouts at the same speed. They were able to demonstrate the lack of difference in their technique sufficiently for some people to quiet down about it. Eventually the whole debate just cooled off and vanished. This entry was posted on April 21, 2011 by Apache. It was filed under Dance, Lindy Hop . 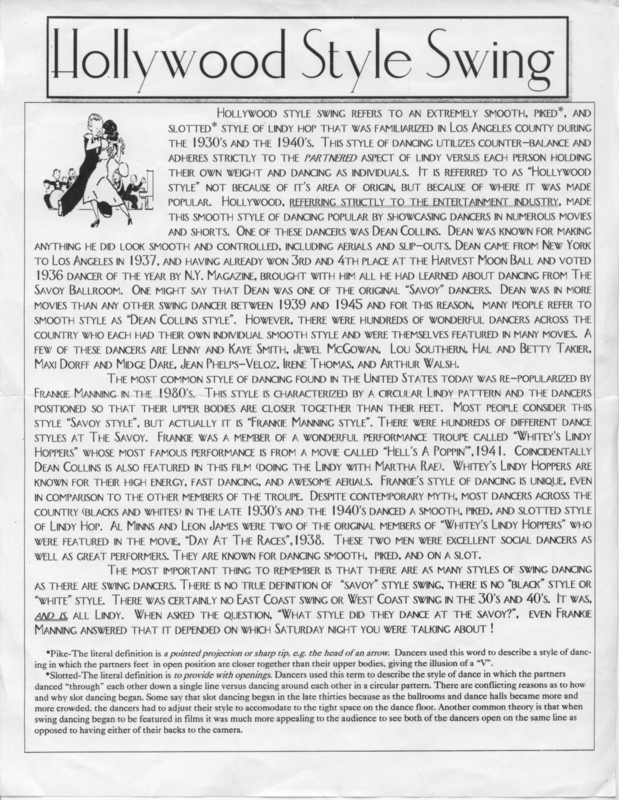 Something I do find very interesting from that old flier is near the top where it attempts to make a technical distinction between the two styles, that Hollywood uses counter-balance and a more “partnered” mechanic while Savoy they say the dancers each hold their own weight. While the semantics have changed (you rarely if ever hear “Hollywood” or “Savoy” anymore), the debate hasn’t left us. Today people struggle for good monikers to identify what they are talking about, but the same core argument over using counter-balance or holding your own weight is still very much with us. Sometimes you’ll hear it stated as, “I prefer a lighter connection” (or a heavier one), but it’s really code for the same old ideas and preferences. And just like in the 90s you’ll still hear plenty of people demanding that their way is the One True Way and everything else is shait.